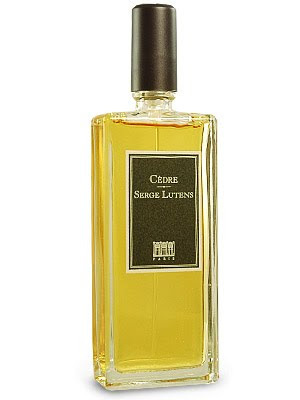 If you are a normal person and you are going to make a perfume called Cèdre, which is the French word for cedar, then by god you are going to make a cedary scent, something that puts the spotlight on the wood. If, on the other hand, you are Serge Lutens, which is to say by definition you are not a normal person, then you are going to make a big, wild-eyed tuberose scent and confuse the hell out of everyone. I am generally very black-or-white: either I love something absolutely or I despise it mercilessly. Sometimes, though, something uncategorizable slithers into my Manichaean worldview, and I will concede that whatever it is, it is very good; I just don't like it. Cèdre is such a thing. The opening is an explosive tuberose, kind of dirty, with a weird toothpasty quality--toothpaste without the mint in it. There is a faint burning spice in there, although really nothing could survive the onslaught of tuberose sweetness. The sweetness is key, because this doesn't have that harsh, screechy edge that tuberose so often has for me, and that's the only reason I could sample this and not desperately want to scrub it off. Even so, it's kind of cloying; it keeps coming at you, demanding to be noticed. Eventually the floralcy, though not the sugar, begins to die down a little, and the cedar finally sidles into view, with the faint ribbon of wood smoke that cedar so often carries. This is very nice, and it lasts a very long time. Cèdre for me works less as a scent than as an intellectual experiment, an essay in cognitive dissonance: what you read doesn't match what you smell, and what you smell is two extremely disjunct things forced into harmony. I could never wear it, that's for sure. As I said, I don't like Cèdre, but I rather admire it, and I bet that there are people out there who adore it. I simply can't stand this one. It smells entirely like my grandma used to do, an 'old people in the bus' kind of smell:\ and yet i still get the feeling that it is, as You like to say, very well made, a high quality like always witch Serge scents. I guess it's only characteristic for Lutens that his perfumes are a bit like a very bitter chocolate or perhaps a very old wine (or portishead music:) - you wont enjoy them without some experience but if consider yourself a connoisseur then there is hardly anything better. Your English is just fine. I think maybe the "old people" kind of smell you perceive is the heavy tuberose, which some people interpret as a perfumey, old-lady scent. I agree with you that most Serge Lutens scents are sophisticated, and an acquired taste: I wouldn't expect a novice to like them (except the obviously appealing ones like Un Bois Vanille and maybe a couple of the florals), but once you have some experience with out-of-the-ordinary scents, Luters' creations are like a drug. To me, anyway. Ma annusate l'olio essenziale di legno di cedro Atlas prima di fare recensioni errate!